This paper compiled the Tsunami waveform data from tide gauges, GPS wave gauges, and ocean bottom pressure gauges associated with the 2011 Tohoku Earthquake. From the waveform inversion, the authors successfully explained the two-step waveforms, which were the most outstanding characters of the data. First, to explain the initial rise in water level, the slip on the plate interface was estimated at the southern Sanriku and Miyagi-oki, around the epicenter. Second, to explain the later impulsive waveform, a large slip of around 40 m was modeled along the trench axis. 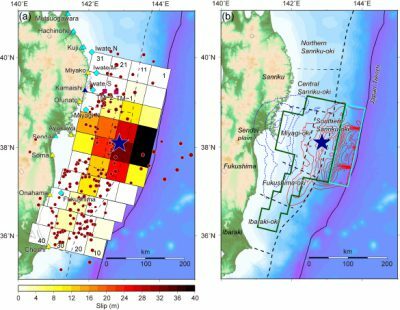 This timely publication, as a contribution to the special issue of “First Results of the 2011 Off the Pacific Coast of Tohoku Earthquake”, provided a standard model for the study of the 2011 Tohoku earthquake. As such, this paper has received a large number of citations and is therefore well-deserved of the EPS Excellent Paper Award 2016.